Dress up a bare wall with Seamless Vector Pattern With Hand Drawn Mexican Elements Guitar, Sombrero, Tequila, Taco, Skull, Aztec Mask, Music Instruments Perfect canvas wall art from Rosenberry Rooms. This canvas wall art is created using the highest quality reproduction methods available today. Incredible color and clarity is displayed in each piece of canvas wall art. 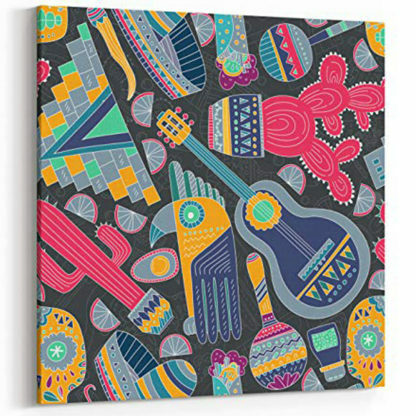 Canvas wall art is perfect for adding color and style to bedrooms, kitchens, living rooms, bathrooms and more! Since 2004, Rosenberry Rooms has been offering thousands of diverse styles from hundreds of artists.